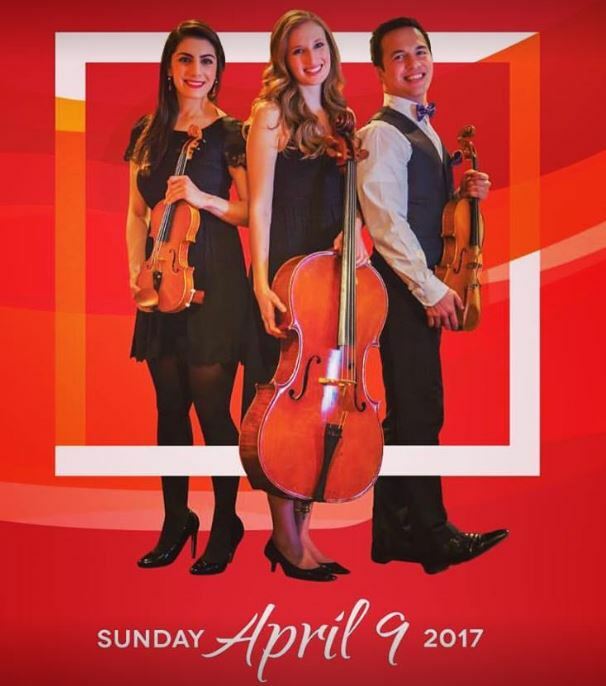 Sunday, April 9, 2 p.m.
Chamber music is very much alive and well in Edmonton. We are fortunate to have both the Edmonton Chamber Music Society and the Edmonton Recital Society bringing in chamber musicians of international calibre. The Solstice chamber music festival celebrates its tenth anniversary this June. The Vaughan String Quartet has now established itself as Edmonton’s main string quartet, offering a full season of concerts each year. What Edmonton has not had recently is a home-grown professional string trio – until now. 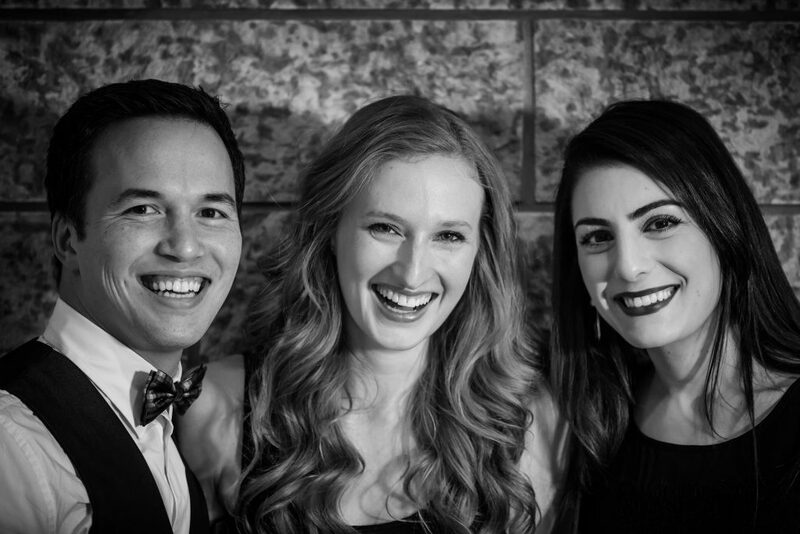 For two members of the Edmonton Symphony Orchestra, violinist Neda Yamach and violist Clayton Leung, have joined together with cellist Kathleen de Caen to form the Trio de Moda, and they will give their inaugural concert this Sunday. All three players are young, enthusiastic, and excited about the possibilities for a string trio in the city. Neda Yamach grew up in St. Alberta, and started playing the violin at 5. She studied in New York and at McGill, returned to Alberta in 2010 to play with the Alberta Baroque Orchestra and Kent Sangster’s Obsessions Octet, and joined the ESO in 2011. Clayton Leung was born and raised in Vancouver – where he and his brothers all played string instruments – and also studied in the States, at the Cleveland Institute of Music, as well as at the University of Victoria. Originally a violinist, he switched to the viola, and after his studies joined the Newfoundland Symphony Orchestra (he also plays the guitar and the ukulele). In 2013 he moved to Edmonton to join the ESO. Kathleen de Caen grew up in Edmonton, and did her masters in Montréal, where she also studied the El Sistema project, a method of teaching children to play classical music instruments, especially disadvantaged children. When the Edmonton Symphony Orchestra started the YONA-Sistema project in the city, she returned to join the staff, and is the project’s cello teacher (both Leung and Yamach are ESO ambassadors for the project). De Caen – whose father had himself played in a string trio – had originally met Leung at a Toronto music festival, and the three players became friends in Edmonton. “I had always wanted to work with Neda and Kathleen,” says Leung. They already have another couple of concerts in the works after this inaugural one, and their new web site should be up this week. Their program on Sunday will mix the familiar with the more adventurous. They’ll be playing Dohnànyi’s genial and lyrical Serenade, a regular staple for string trios, and Beethoven’s rather grand but energetic G major trio, Op. 9, No. 1. They will also be playing Penderecki’s masterful little String Trio. It was completed in 1991, in a period when Penderecki was beginning to ingrate some of the more avant-garde techniques of his earliest works with the neo-Romantic style he had cultivated over the previous two decades. The String Trio, though, is harmonically largely tonal, and it’s a gritty work, managing to combine a dramatic thrust with more lyrical writing, providing plenty of opportunities to for solo playing among the trio, and with a fugue weaving through the end of its powerful 13 minutes. The concert admission is by donation, and takes place at Holy Trinity Anglian Church this Sunday (April 9) at 2 p.m.